southern orders : DANGER OF INFECTION FROM COMMON COMMUNION CHALICES--AN UNDERESTIMATED RISK? DANGER OF INFECTION FROM COMMON COMMUNION CHALICES--AN UNDERESTIMATED RISK? From a liturgical and theological point of view, I have no problem with the laity receiving the Precious Blood. I've always been in parishes since 1976 that allow it for every Mass every day. My personal problem has more to do with hygiene, the spread of bacteria, viruses and the like. There are also some concerns about spillage and backwash of saliva in the chalice after so many have consumed and the need to cleanse the chalices by drinking the ablutions. The thought of it disgusts me. I believe intinction is the perfect solution and I would recommend that it be allowed for every Mass EF or OF! So there. Liturgists who are more concerned with liturgical correctness rather than public health will cringe at the following findings and will continue their now tiresome charade of saying this isn't true. Never mind that throughout America three years ago, the common chalice was banned during the H1N1 flu virus, the first time ever that bishops in the Church acknowledged that the common chalice could be lethal for those who approach it if contaminants of germs, bacteria and viruses are on the rim of the chalice or the mix of Precious Blood and backwash. One could actually contract a deadly flu virus! That was a monumental acknowledgment! 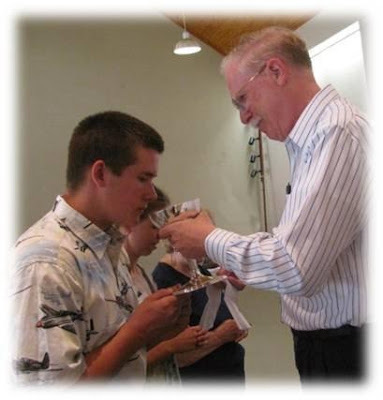 Danger of infection from communion cups--an underestimated risk? The problem of a risk of infection from the common use of chalices has been discussed controversially in literature. Opinions were mainly based on laboratory experiments and theoretical considerations. The authors examined bacterial counts and species existing under normal conditions after communion. For this purpose, contact samples were taken from the inside and outside of chalices at the rim. Staphylococci and alpha-haemolytic streptococci were found on all chalices examined. On more than 80%, there were apathogenic micrococci, nonhaemolytic streptococci, apathogenic neisseria and apathogenic corynebacteria as well as lactobacilli and bacilli. Staphylococcus aureus was found on 26.4% of chalices. Although the risk of infection for healthy persons from a commonly used chalice can be rated as low, it should not be underestimated for persons with reduced resistance and immunocompetence, or with reduced defences as a result of therapeutic measures. From the hygienic point of view, the most favourable approaches to avoid infection would be the use of individual chalices for all participants in the communion or the immersion of wafers or bread in wine or in grape juice by the priest (intinction). "When Our Lord said, 'This is My body,' the entire substance of the bread was changed into His body; and when He said, "This is My blood," the entire substance of the wine was changed into His blood. "(a) Christ could not have used clearer, more explicit words than "This is My body." He did not say, "This is a sign of My body," or "This represents My body," but, "This is My body." Catholics take Christ at His word because He is the omnipotent God. On His word they know that the Holy Eucharist is the body and blood of Christ." Somehow we have forgotten that the Body AND Blood of Christ are both present in the Host. Which makes receiving under both species for the laity unnecessary. Personally, I tremble to think of even taking the Sacred Chalice in my profane hands. Perhaps those who came before us had more wisdom than we give them credit for. Thank you for Intinction at 3 out of 5 of your parish's weekend Masses. I hope it doesn't go away when summer is over. This is the primary reason I decline the chalice. Right now we are in a pertussis "epidemic" (per the health dept), so another good reason to decline - one of the EMHCs this past Sunday was coughing and he still drank from the chalice. Of course, the priest wandered around the church shaking hands, so germs could easily be spread this way as well, especially since he does not wash his hands in the sacristy prior to Mass. OK, now I'm thinking spiritual communion is a better and better idea :-)!! Wait, wait! Pater Ignotus, M.D. has to has to come swaggering in with his expert medical observations regarding disease transmission and epidemiology. I wait with bated, Listerine scented breath. Is it still required for an Extraordinary Minister of Holy Communion to finish the chalice if there is any left over? I hated that part. There's also a certain amount of "backwash" of saliva flowing into the chalice which, towards the bottom of the chalice, can invalidate the sacrament for the last persons to receive it. I understand the liturgical value of at least some of the congregations receiving from the chalice on occasion, by one means or another, but I do not understand why individual communicants make such a big deal about them personally receiving under both Kinds at every Mass. I suspect a sort of "spiritual infection" worse than the natural kind that is contaminating their understanding of the True Presence. The Council of Trent was right in denying the Chalice to the laity since protestants insisted that Communion was incomplete without it. Vatican II was right in saying that it could be restored in certain circumstances since no Catholics now believed that Communion in one kind was invalid (for the laity). Step forward the liberal bishops of UK and USA who petition Rome for a universal offering of the Chalice (for pastoral reasons of course). Result? A generation of Catholics who think Communion has to be in both kinds. Until very recently, it would appear that the Church on both sides of the Atlantic has been in the hands of men who are naive, or stupid, or both. John, I think the lib bishops knew exactly what they were doing. Communion in both kinds involves the laity on more levels (EMHC's, for instance) and emphasizes the meal aspect more. I think it is all part and parcel of the progressivist/egalitarian mind set. Right, Gene, except that the argument should be taken a step further. The goal was to undermine the concept of the Real Presence. If not only a priest, but any layman, can take the Host and the Chalice in his own hand at will, then not only the Real Presence but also the concept of a Priesthood set apart by ordination is undercut. The evidence is in the result that only a minority of Catholics retain the traditional belief. It might be a step too far to say this was the specific goal of the bishops themselves, but it was pretty clearly the goal of the liturgical establishment--whose stature in the liturgy (at the expense of priests) as the special character of priests is diminished--that put these actions before the bishops, to largely be rubber-stamped. As most of the actions of the bishops conference are foisted upon them by their lay bureaucracy. In that the bureaucracy largely sets the agenda to which the bishops themselves only react. I've personally have heard a well-known bishop say that the bishops can do little more to stop these actions than a layman like you or me. As I sit here with the flu I have to wonder if the communal cup was the culprit. Also as a person who suffers from celiacs, I really do not have another choice. I am way too sensitive to wheat to even take the low gluten wafers. Why can't we take the wine in individual cups? I can't see how it changes the fact that it is the blood of Christ. HOW DO WE GET MORE VOCATIONS TO THE PRIESTHOOD? I'VE WRITTEN IT BEFORE, I'LL WRITE IT AGAIN! MY LITURIGCAL PRAISES, RANTS AND INSECURITIES! DO NUMBERS COUNT? DO NUMBERS LIE?